Osmosis is a naturally occurring process whereby water in pure form will pass across a semi permeable membrane into a more water solution of higher salt content in order to balance the concentrations of the two. The membrane allows the water to pass through but not allow the dissolved salts and mineral to pass. The process of Reverse Osmosis is achieved by applying a pressure to the concentrated side of the membrane to reverse the natural process, and force the pure water through the membrane. The membrane will allow water molecules through, leaving behind the dissolved salts and minerals. 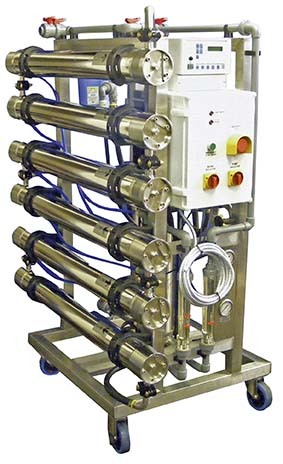 RO units use specially designed membranes (typically spiral wound) which are housed in a pressure vessel containing single or multiple membranes, with the simplest form of RO unit consisting of a pump, membrane and housing. The membranes are constructed in order that the pure water (or permeate) is fed into the central core of the membrane and passed to service, whilst the remaining water with the dissolved salts and minerals (reject or concentrate) are then routed to drain. Typically an RO membrane will reject 95 – 99.5% of the dissolved salts and minerals from water, giving a water quality of around 10 – 20 microsiemens depending on the construction of the membrane and the supply water quality. RO units can utilise a single membrane or multiple membrane elements, and depending on the configuration of the system recovery rates of pure water can be achieved up-to 75%, with 25% being concentrate water to drain. With the use of multiple membranes, recirculation and controllers which allow for flushing of the membranes, consistently good water can be achieved whilst maintaining the efficiency and life of the membrane. The use of Reverse Osmosis to produce high purity water is considered much safer than other means of production as no chemicals are required for regeneration of resin beds, there is nothing added to the water and leaves no residual chemicals within the water to service. Reverse Osmosis has many applications ranging from Renal Dialysis, Sterile Services rinse water, boiler feed water, pharmaceutical make up water through to the manufacture of soft drinks and manufacture of foods. Capital Water can supply a full range of Reverse Osmosis units ranging from 2m3 per day up-to 20m3 per hour. The use of correct pre treatment is imperative for RO which includes filtration, water softening to reduce the potential for scaling or fouling of the membrane and carbon filtration to remove chlorine to prevent chemical damage to the membranes. The correct pre treatment will help to maintain the effectiveness and efficiency of any Reverse Osmosis unit, reducing downtime and extend the life of the RO membranes.